This category includes statues and specially selected home decor that honors the fierce loyalty and bravery of the modern soldier. Expect highly detailed statues and figurines that capture the warriors of the Army and Navy in their finest moments. Look for furnishings and decor that commemorate the Air Force, Marine Corps, and Coast Guard as well. Find the perfect statue to gift to a beloved veteran. Show appreciation for a family member who has found their calling in the military with decor that expresses your pride. 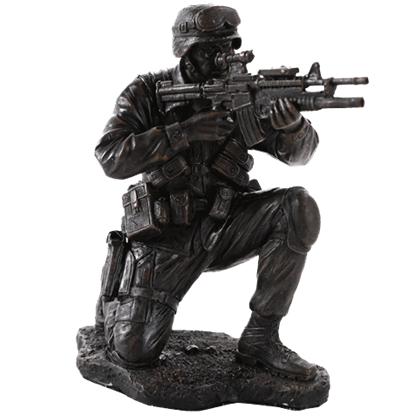 We honor the valor, skill, and sacrifice of the military with a wide selection of statues, figurines, and home decor made in their image. The only thing we have to fear is fear itself-FDR. 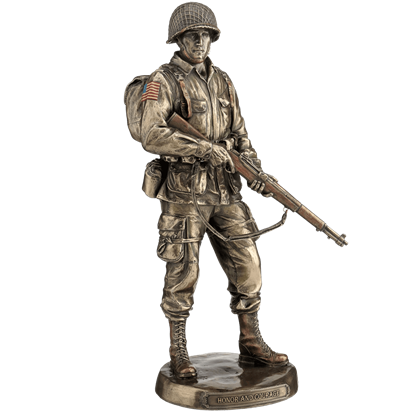 This lifelike Bronze US Army Soldier statue features an accurate interpretation of the equipment that the brave US soldiers dawned during the war to end all wars, World War II. 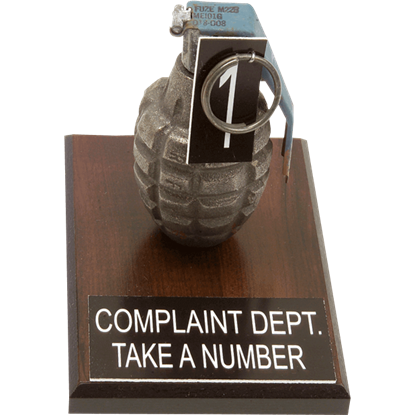 Welcome to the complaint department. Please take a number, and go sit at the far side of the room. Thank you. Or something to that effect. This Complaint Dept. Hand Grenade Display is a desk decoration that looks to be quite real. The advent of explosives in warfare forever changed the way we do battle. The invention of the grenade allowed soldiers to take out multiple enemies at once without special training. 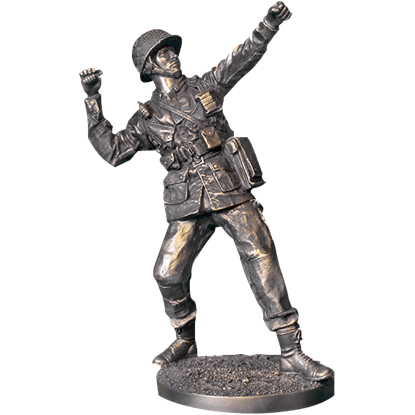 The Grenade Toss WWII Soldier Statue depicts its use. From head to toe, including the gun he holds ready in his hands, this soldier is prepared for battle. 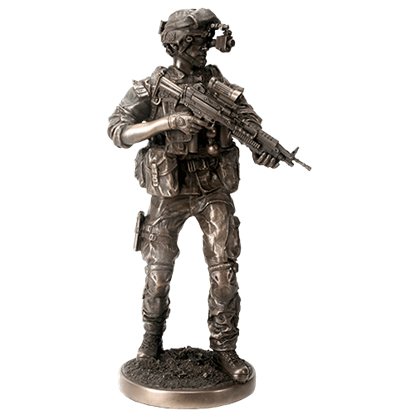 Made of high quality cold cast resin, the Infantry Soldier Statue displays a modern soldier with incredible attention to detail. With his helmet under one arm and a bag in the other, this solemn pilot stands, for the time being, on solid ground. 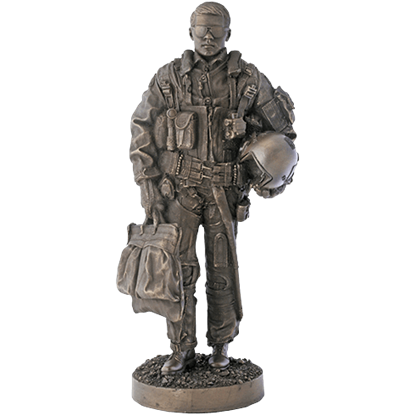 The Jet Fighter Pilot Statue depicts this uniformed member of the Armed Forces with a remarkable level of detail. With his eye to the scope, this soldier prepares to take the shot. 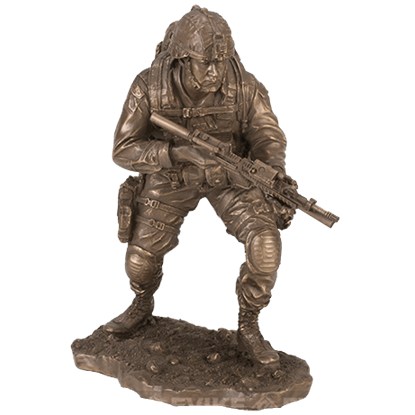 The Kneeling Soldier Statue depicts this modern military man with extreme detail, from the marks on his helmet all the way down to the dirt-like texture of the base. Looking down the scope of his gun, the Navy Seal prepares to fire at the enemy. 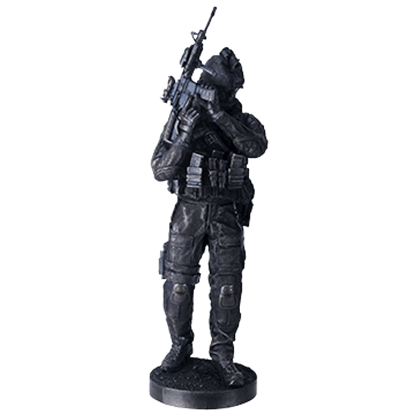 The Navy Seal Aiming Statue depicts this modern soldier in fantastic detail, revealing every intricate element of his tactical outfit in cold cast resin. 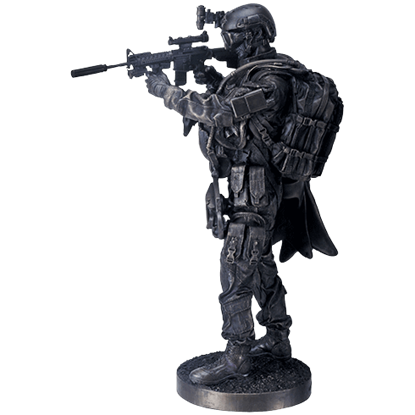 Able to fight on any terrain, an elite group is wonderfully represented with the Navy Seal Statue. You can rest comfortably at night knowing that brave soldiers are willing to fight in any environment to protect our freedoms. Through cover of darkness, a soldier must be prepared to successfully engage any opponent or situation. Commemorate the duty of those valiant soldiers who thrive within the darkness with the stunning Night Mission Statue. Alert to his surroundings and at the ready, the soldier keeps watch to protect his comrades. 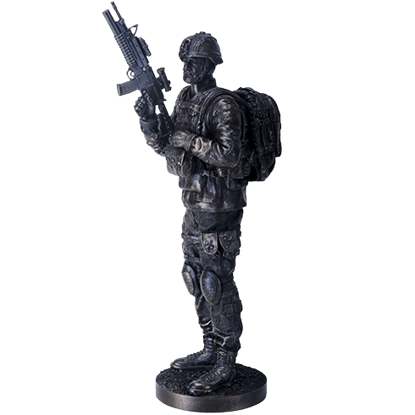 The On Guard Soldier Statue depicts this modern soldier dressed for combat in excellent detail and crafted from high quality cold cast resin. In the field, orders can quickly change, and a soldier must be prepared to react at a moments notice. The On the Move Statue captures this idea and creates a stunning model of a battle ready warrior who can adapt to any scenario. 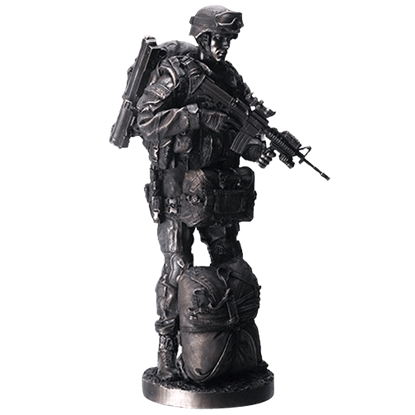 Show your pride for the armed forces with the Paratrooper Statue. 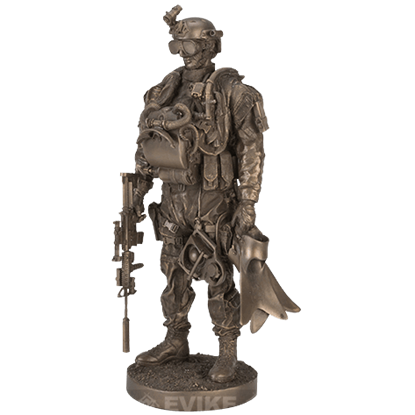 This figurine captures the portrait of brave soldiers that specializes in parachuting into hostile environments and bringing justice to oppressed territories.